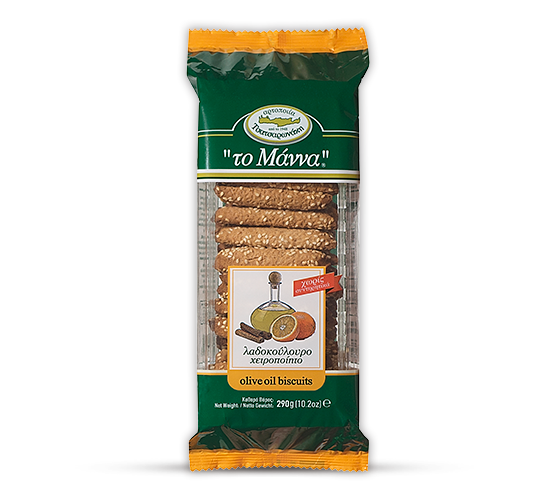 Handmade olive oil biscuits with fresh orange juice and cinnamon 290gr. These traditional biscuits with a distinct taste of cinnamon and clove, provide all the deliciousness of a biscuit whist providing health benefits. They are made with ingredients and a recipe that respects tradition and contain excellent olive oil, a great deal of natural sweeteners (natural orange juice, natural raisin extract) and sesame seeds. Olive oil increases the yield of beneficial fatty acids relative to a conventional biscuit. Natural sweeteners increase the content of minerals, trace elements and fiber while sesame contains beneficial fatty acids and calcium. They are made in the traditional handmade way and are the ideal accompaniment to milk, coffee or any other beverage. Of course, they are so delicious eaten on their own and are the perfect choice for the Easter fasting period as they do not contain any animal fats.